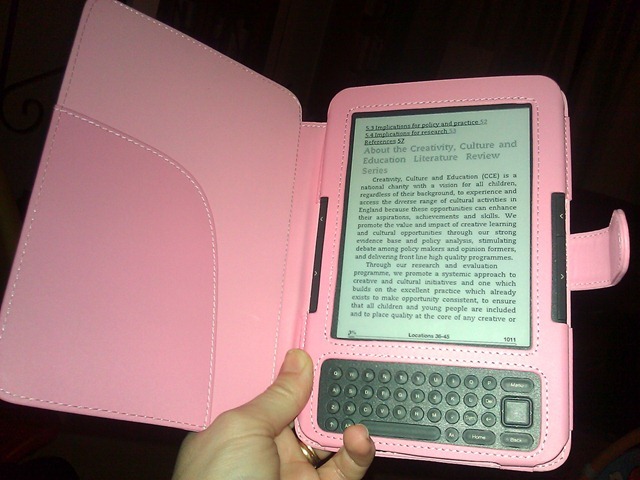 My most useful recent purchase has to be my Amazon Kindle. As part of a de-clutter my husband suggested selling/giving away our room full of books and replacing the ones that we really like on a Kindle. I wasn’t really sure at first but it has been just fabulous. I often find myself downloading pdf documents that I think might be interesting or useful for work and then they sit around on my laptop without being read. Occasionally I will read a few pages before my eyes get tired from reading on screen. Now that I have my Kindle all I need to do is email them to my Kindle email address with the subject ‘convert’ and they are instantly transferred to my Kindle in an easy to read format. Now I can sit and read them like a book without having to print them and they are always to hand. I can organise them into folders so that I can find them easily and there is even a function for defining words that you do not understand (very useful when reading journal articles). When I’m bleary eyed I can change the size of the text and the unlit screen isn’t harsh, but slightly brighter than a standard book. I could happily read by the light of the fish tank when researching a few nights ago. I’m hoping that as more books become readily available I won’t have to carry piles of books or study with a stack of books next to me. They will all be contained in my little slimline friend. We are even considering buying one for my daughter’s 7 th birthday – she is such a bookworm . I could make some much needed space in her bookcase and as an able reader who usually reads alone, she would be able to look up anything she didn’t understand. I think this would bring her reading to another level. Though stopping her from ordering endless books on my credit card may be an issue. And as an added bonus you will be able to subscribe to this blog on your Kindle in the next few days. Pingback: Book Week round-up | WAHM-BAM!